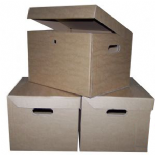 A4 Archive storage boxes are the perfect solution to storing or moving large amounts of paper work. They are durable, can take the weight of a huge amount of paper as well as being stackable. If you need more office supplies to help keep your paper work organised then take a look at our stationary section in office supplies where we have a great range of office solutions and tools.